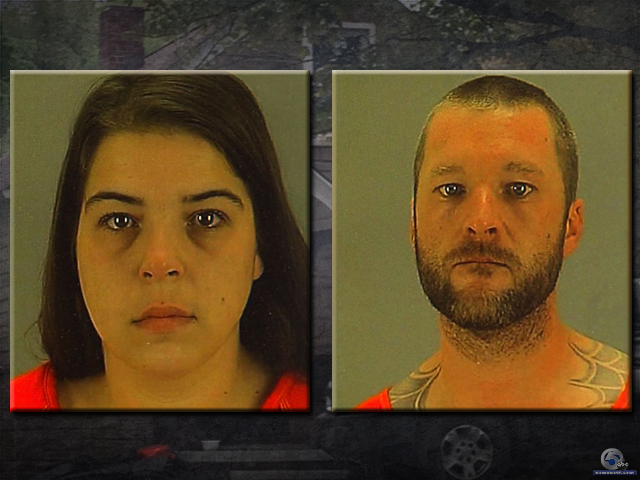 Three young children were taken from a home in Akron's Ellet neighborhood after officers discovered a large meth lab. The kids, ages 8, 5 and 1, are now in the custody of Summit County Children Services, but staying with relatives. A spokesperson for the agency, Chris Vasco, said the children will be examined at Akron Children's Hospital within five days. Their parents, 31-year-old Amanda Wilcox and 34-year-old Jeffrey Fowler were booked into the Summit County Jail on multiple drug and child endangering charges. Lt. Brian Simcox said Akron's Clandestine Lab Enforcement Team has never come across a larger "shake and bake" meth lab in the city. "The house was just a giant meth lab, the entire lower level of the home," Simcox said. "There were over 100 meth lab bottles in the house and probably 30, 40 or 50 acid gas canisters." Pictures taken by police show boxes of bottles and canisters covering the driveway, along with ingredients commonly used to make meth, like lithium batteries, Butane, cold packs, hundreds of boxes of Sudafed and hot plates. Police responded to 2388 Congo Street Saturday afternoon after receiving an anonymous tip that meth was being cooked in the basement and children were inside the home. Simcox said officers found two actively cooking one-pot labs and the investigation revealed meth was cooked daily at the home over the past six months. "With this many bottles, I think it's impossible to think that this is personal consumption. With this many bottles and the precursors and the chemicals and everything they had, they had to have been selling," Simcox said. Police said all of the chemicals from the giant lab put the health of the children at risk and the possibility of an explosion left neighbors in harm's way. "Each of these 105, 106 bottles are miniature bombs that can catch fire at any time," Simcox added. Neighbors were suspicious of the many people coming and going from the home, but never imagined a meth lab of this size. Betty Hershman lives next door and said she feels badly for the kids. "I couldn't believe this was going on right next door to me," Hershman said. "It's very scary. It's very scary."